The 2012 SSWBL Home Run Derby will take place at U.S. Steel Yard - Home of the Gary SouthShore Railcats prior to the All Star Game. The contest will start at 11:00 am, Stadium gates will open at 10:00 am. For players there is a $10.00 entry fee. Players may use aluminum bats, but they must be a -3 drop weight. They cannot be used in the All Star Game at all. 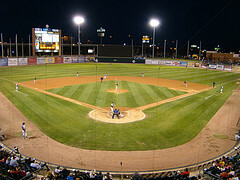 The 2012 SSWBL All Star Game will be played at U.S. Steel Yard - Home of the Gary SouthShore Railcats. The game will feature both divisions - Maple vs. Ash and showcase many stars players from different teams in the SSWBL in a one 9 inning game of baseball. Game will approximately start at 1:00pm. The 2010 SSWBL awards will be announced before the start of the game. This includes the presentation of the Division Champions trophies as well as the 2012 SSWBL Champions Trophy and Woody Ball Championship Runner-Up. Copyright © 2012. South Side Wooden Bat League™, All Rights Reserved®.